One of the best gift sets you are ever likely to encounter. This handsome box from Gordon & MacPhail contains a fantastic 1982 vintage Old Pulteney whisky, and a beautifully patterned Glencairn to drink it with! It is the whisky, however, that is the main event here. This whisky is an incredible 1982 vintage, which was bottled in 2015, following full maturation in sherry casks. Old Pulteney is one of the most northerly distilleries on mainland Scotland, and possesses a distinctive North Highland style, with plenty of maritime influence. This dram serves up notes of cedarwood, sherry, citrus peel, raisins, marmalade, plums, sea spray, toffee, dusty old oak, leather, warm malt and a touch of flinty earth. Bottled at 43% ABV, this strength ensures a thick mouthfeel and slightly more intense flavours. The whisky is both non chill filtered and natural in colour. 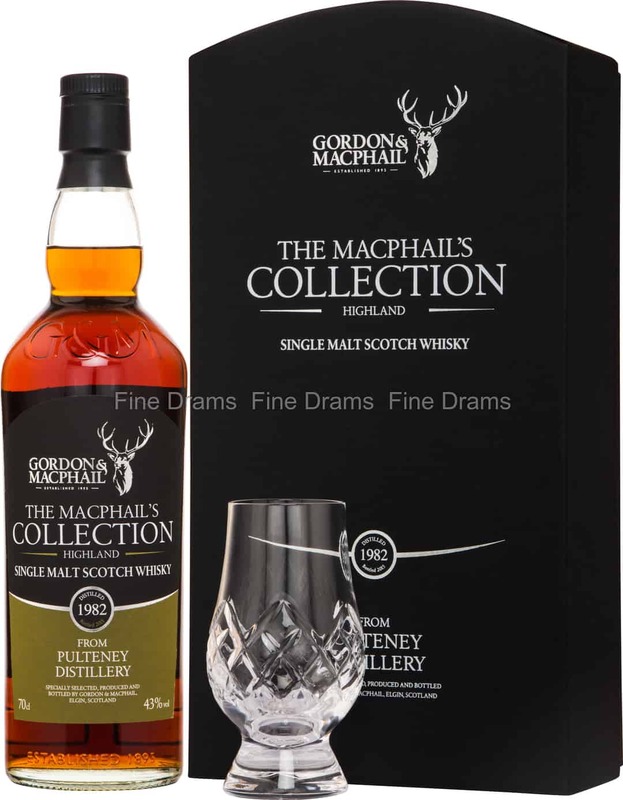 Delightful in every respect, Gordon and MacPhail have done it again.